Elephant Special Tours supports the Thai community in the rural district of Mae Wang as well as the hilltribe of the Karen through the impact of targeted social projects. With the help of soft tourism and with resprct for the environment We try to created a social compatibility that benefits the local people and keeps their individuality. Elephant Special Tours supports the local people in the sparsely populated reagion of Mae Wang by targeting a balanced implementaition of touristic structures in historical circumstances. Changes that only serve for profit maximization, are usually not of advantage for the local people and often poke disapprobation for a good reason. 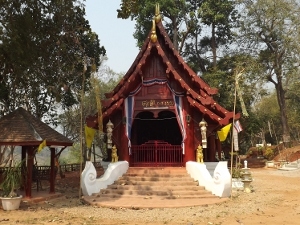 Therefore, a constant exchange and a viral cooperation in the everyday life of this small valley in Northern Thailand is beneficial to all sides. 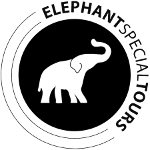 Through the purchase of articles of daily use and food on spot, with participation at traditional festivities, through discussions with the local authorities and and last but not least by the certainty of being one of the largest employers in the region, Elephant Special Tours is actively involved in the Development of the area. The TONG-BAI FOUNDATION is a non-profit relief organization and was set up to offer dignified living and working conditions to elephants, their owners and their mahouts. All funds raised by the TONG-BAI FOUNDATION are exclusively used for elephants. This may be purchase of animals, which do not “make any money” in the tourism sector because they are too sick, too old or too distraught. These animals live in the camp of the foundation or can be kept as followers in the camp of Elephant Special Tours (without any commercial interest) and thus be protected from a serious fate. These animals do not have to work for their living, but can be used to their abilities and inclinations. A trained working elephant needs occupation – as a matter of fact it can die because of bordom and dullness. Very young elephants can be ramsomed from working conditions that are too hard, so they can develop naturally according to their age. The habitat of wild elephants becomes smaller and smaller and their population decreases continously. The domesticated working elephant comes from a long tradition in Thailand and has a very high reputation. Humans and animals work together as equals, are dependent on one another and are given mutual respect. 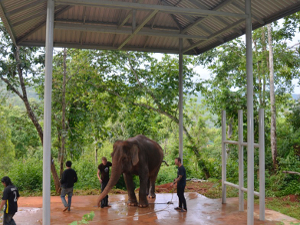 The TONG-BAI FOUNDATION wants to create a living and working environment for the elephants and their people as this equilibrium is unfortunately seriously disturbed today. The commercial company Elephant Special Tours supports the non-commercial TONG-BAI FOUNDATION with advice and – wherever possible – financially. Together with the Tong Bai Foundation we are establishing a Vet Point (veterinary station) not only for our but for all elephants dwelling in our valley. In case of minor injuries or diseases a veterinarian of the state hospital can come to us to examine and treat the elephants under suitable conditions, sparing them a transportation by truck to the far off hospital in Lampang. The Tong Bai Foundation is continuously dependent on donations to professionally equip the Vet Point. 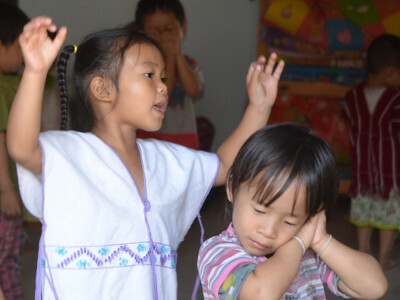 Natalie and Marius brought lots of fun, joy and bright smiles to 20 orphans. With much love and dedication they organized a Children’s Day on a sunday in October for the little guests coming from an orphanage in Chiang Mai. For most of the girls and boys this was the first time to get in touch with a gentle pachyderm. As you can see on the pictures, the mood was happy and cheerful! The well-respected teacher, who introduces numbers and letters to the kids in a playful way, was about to be transferred to another region (with nobody to replace her!). It quickly became clear that we had to act here. Together with other supporters of the area, we have been taking over the salary of the kindergarten since then and are happy that she will be able to stay with the children of our village. 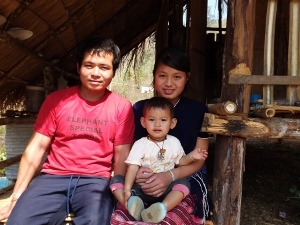 We like to enable our mahouts to live together with their families in our elephant camps. So far, the young men have been living only among themselves and shared a cottage. Due to their profession, the mahouts have to stay close to their elephant: they constantly provide it with food and water. this can be a true obstacle for a family-life with a wife and children. In January 2012 the first family house in our camp was built. We are happy to be the first camp, that offers the opportunity to combine family and profession. For this year’s dancing competition, we have supported girls between 12 – 14 years with outfits and the entry fee for the tournament. For the pleasure of our guests and our employees, they have rehearsed at the lodge every now and then for the great performance. It is rarely allowed to get wood out of Thailand’s forests. For the new temple in our little village of Mae Sapok, near Chiang Mai, we had the unique chance to do this with former timber elephants. With the biggest elephants of this area, Elephant Special Tours has revived this century-old tradition for 2 days. Since 2008, Elephant Special Tours is paying the fees for the education of Wida Tomali, the sister of both of our camp chiefs. Wida is studying administration management at the university of Chiang Mai. The school in Hoi Pong collected donations for a new drive-up way and for a parking lot for the busses, that transfer the kids to school and back home. Of couse we also took part with a donation. 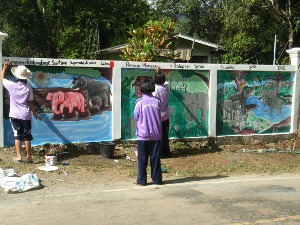 In return, the school kids of the classes 6 and 7 have decorated our old boundary wall with colourful paintings of elephants. In 2006 we extended our support of the youth sports club. 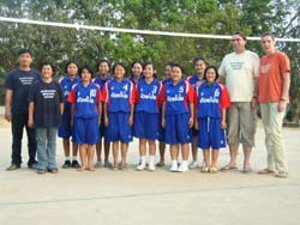 In February we have sponsored the girl’s volleyball team with new tournament clothing. Since 2006, Elephant Special Tours is paying the fees for the education of our staff manager Seng’s daughter. 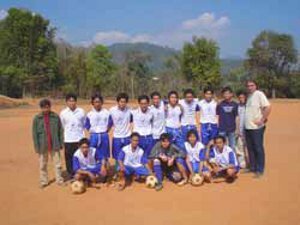 In springtime 2004, the junior and senior football team in Mae Sapok was ready to compete at the regional championships. But there was no appropriate tournament clothing. So we donated a part of our income to supply the team with team jerseys. All secondary schools and universities demand a fee from the families to educate their kids. Governmental education endures 9 years. 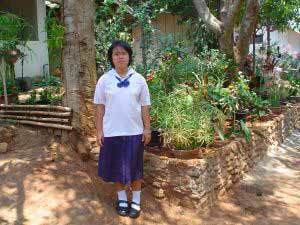 Unfortunately it is still not possible for so many families in Thailand to send their kids to a secondary school. With our initiative, we were able to arrange sponsorships for students to cover the yearly fee of approximately 200 €. 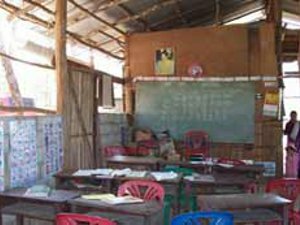 In the Karen village of Pamon we have built a little school with a part of our income. Many children in this area are not able to go to school because the way is too far or the family’s income is too low. With support of employees of the royal project in Mae Sapok we were able to turn our plan into reality. 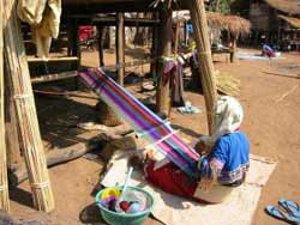 Most of the women of the Karen people are dependent from the daily income of their husbands or other members of their families. Some of the hilltribe women still know traditional ways of weaving clothings using mechanic hand looms. Under most simple conditions, they are weaving wonderful clothings with magnicifent colours and designs. We show this kind of nearly forgotten culture of the Karen to our guests. The fabrics can directly be bought at the weaver’s. So the incomes go straight to the families and are not reduced by discounts of distributors. Mae Sapok, the village that hosts our lodge, is a little village at the highway 1013 in Northern Thailand. Most people here belong to an ethnic minority called Karen, whose families live from cultivation of mountain rice and with day laborer jobs. When we first came to this area in Northern Thailand, we noticed that the amount of trash caused by plastic bottles is a big problem. Still there is no garbage collection. The Trash was burned or was simply disposed in the forest. With our private initiative and with the support by some locals, we were able to introduce deposit bottles for drinking water and to reduce garbage.